Give the gift of Gino’s East this holiday season with our holiday gift specials! Holiday season is here. 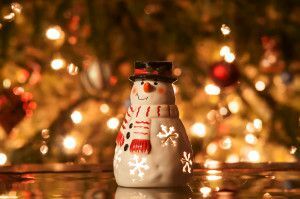 The Christmas music is playing, the decorations go up, the kids get the sleds out and the shopping – so much shopping – has begun. These first months of winter bring together family with holiday feasts and happy celebration. For many, holiday season brings back good memories and provides a happy atmosphere, but shopping can be stressful and time consuming. Giving gifts is great, but finding the perfect gift is the problem. Luckily, we have a gift solution for even the most difficult to shop for relative – pizza! Take someone out to dinner anytime with our gift certificates. 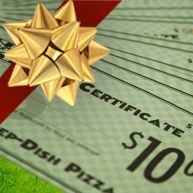 These gifts come in $10 certificates, and can be used at any Gino’s East location. This holiday season, we have a special to Buy $100 in gift certificates, get $30 free! This promotion is valid at our online shop with the offer code GINOSHOLIDAY (offer ends 12/31/2015). The ship a pizza section of our gift store allows you to send the taste of Chicago style deep dish pizza anywhere in America. Choose from 5 of our classic pizza recipes including deep dish patty sausage, deep dish crumbled sausage, deep dish pepperoni, deep dish spinach and deep dish cheese pizza. Each pizza provides 6-8 slices, and feeds 2-3 people making it the perfect gift for families and friends. Lets be honest, does uncle Todd really need another sweater? Does grandpa Jack need more golf balls? Probably not, but do you know anyone who doesn’t like pizza? I sure hope not. Pizza is not a “typical” gift, but it is unique. The best part is, almost everyone on earth loves it. Bring some legendary Chicago flavor to your loved ones’ doorstep this holiday. At Gino’s East, we have the solution to the most stressful part of the holidays – shopping. Pizza is the universal gift, loved by all ages and families. Take advantage of our holiday specials, and enjoy the taste of Chicago style deep dish pizza wherever you may be this holiday season. Happy holidays!